If my father's unlabeled and un-indexed slides are in chronological order, which I believe they are, then he visited Gloucester, Massachusetts in the summer of 1954, shortly after graduating from prep school at The Loomis School in Windsor, CT. I had no idea where these photos were taken until I used a Google image search to help me identify this statue. 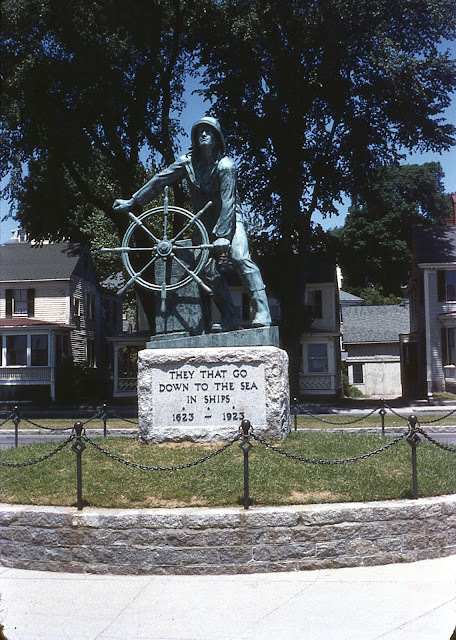 My search revealed that this is "Man at the Wheel", also known as The Gloucester Fisherman, in Gloucester, MA. 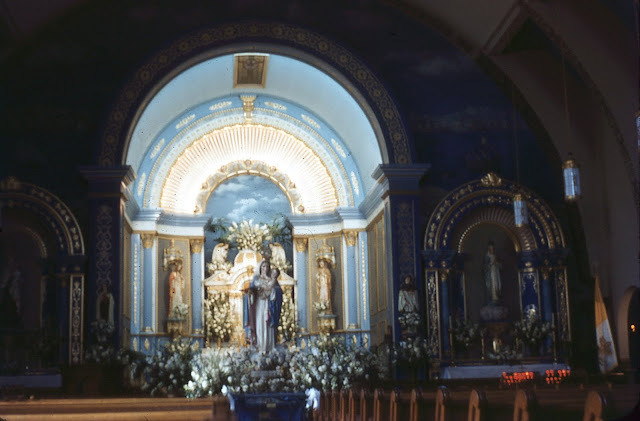 Once I had a location I looked for Catholic churches in Gloucester, MA to see if I could identify these photos of an alter and a church. The church is Our Lady of Good Voyage, originally built in the 1890s (and rebuilt after a 1914 fire) to serve the Portuguese population in Gloucester, which was then the largest Portuguese population on the East Coast. 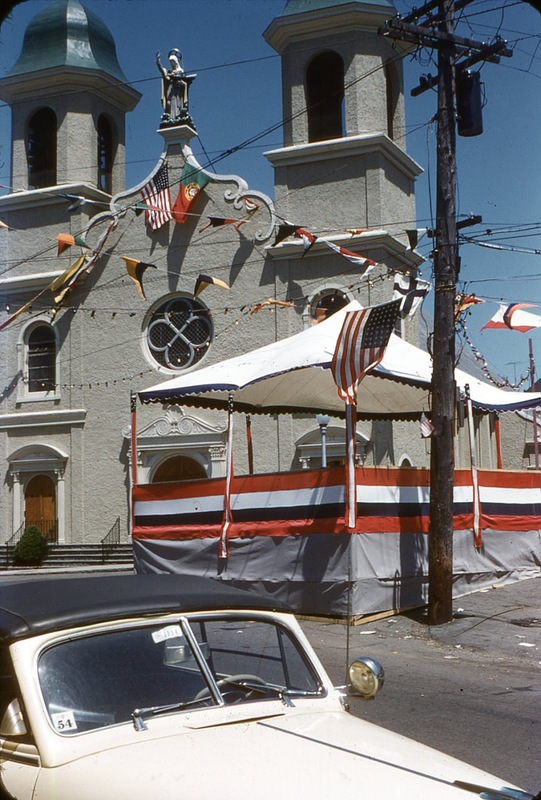 When I first scanned these images the flags made me think of a regatta, but a second look told me it was probably some sort of religious festival. Well, now that I had a location, it was easy to find and answer. 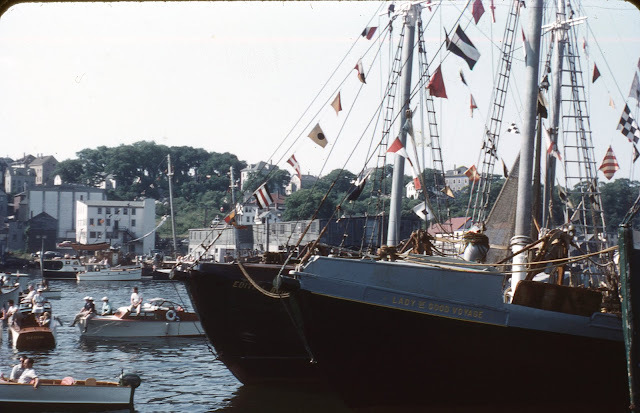 Dad's photos are most likely from the Blessing of the Fleet, an annual event in Gloucester and, at the time, a very big event. You can see even more photos on the Good Morning Gloucester blog. 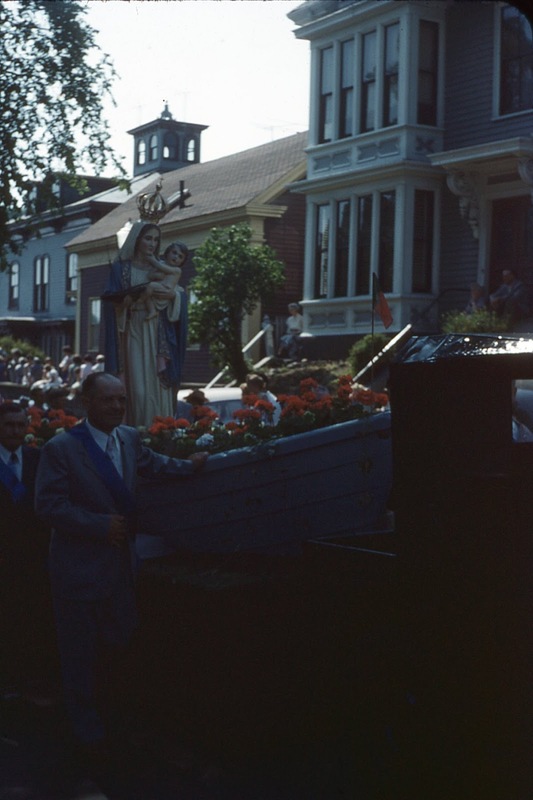 There is a six part series of photos from 1948 that starts here and if you're really interested you can do a search for "Blessing of the Fleet" on the blog for even more photos. Dad's photos sure are giving me the travel bug! What a good lesson on using the Google image search to identify photos. Maybe people won't be so quick to throw away photos of things that lack meaning because they don't recognize what they are looking at. I agree with Wendy--your post is a fabulous lesson on using Google image search. It's also a reminder to label our slides (or make them into prints now) for the next generation. Thanks! I think it was Thomas MacEntee who suggested doing this with photos you have uploaded to a blog to see if anyone is using them without your permission. I suddenly thought it might work if the statue was famous enough and I lucked out. Yes! Label everything, your descendants will thank you, or at least not curse you under their breath! I just scanned some slides that were labeled Christmas 1954, but that would have put them out of chronological order. Luckily I was able to narrow down that one of Dad's cousins was too old in the photos (16 months vs 4 months) to be 1954 and that it was actually 1955. I have had to do a bit of that sort of thing with his slides. 18 carousels and only three were thoroughly labeled!! !